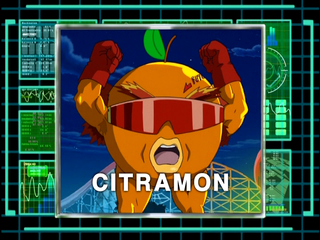 He's a Champion Level Digimon whose Fruit Punch Nova sends his enemies to the showers! Not exactly part of a balanced breakfast, believe me! — Digimon Data Squad: "A Birthday Kristy Will Never Forget!" ↑ 1.0 1.1 1.2 Digimon Data Squad: "A Birthday Kristy Will Never Forget!" ↑ This 'Digimon' is official in the NA/EU regions only. This page was last modified on 15 February 2018, at 12:07.